Alex Hales and AB de Villiers won't be available for Rangpur Riders for the playoffs. The defending champions Rangpur Riders finished as the topper of the group stage after a huge 9-wicket win against Comilla Victorians in their last game. The big win helped them top the table surpassing Victorians. Rangpur needed a win in their final league match to finish in top two and once again face Comilla in the first Qualifier. The Victorians decided to rest their big players to keep them fresh for the playoffs. Rangpur Riders have won each of their last six matches since the former International cricketer AB de Villiers joined the side. His inclusion strengthened the Rangpur with their top four read – Chris Gayle, Alex Hales, Rilee Rossouw and ABD. However, the Riders will now miss the services of both Hales and De Villiers in the crucial stage of the tournament. Rossouw, who became the first player in BPL history to score 500 runs in a season will be crucial for his team. 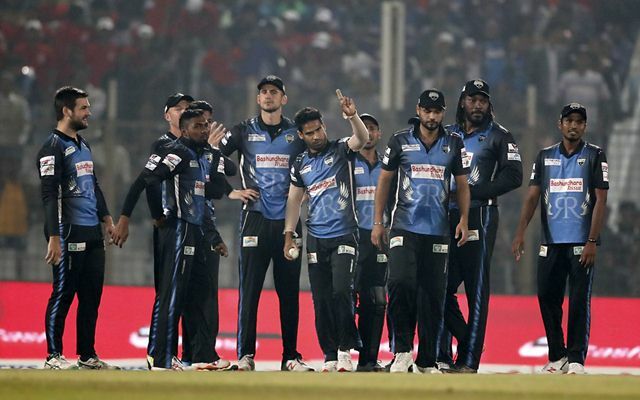 The 1st Qualifier of the Bangladesh Premier League (BPL) 2019 will be played between Rangpur Riders and Comilla Victorians at Sher-e-Bangla National Stadium in Mirpur, Dhaka. The match starts at 6:30 PM local time (12:30 PM GMT) (6:00 PM IST). Tamim Iqbal, Evin Lewis, Anamul Haque (wk), Imrul Kayes (C), Shamsur Rahman, Shahid Afridi, Thisara Perera, Wahab Riaz, Ziaur Rahman, Mohammad Saifuddin, Mahedi Hasan. Bench: Abu Hider Rony, Aamer Yamin, Liam Dawson, Mosharraf Hossain, Mohammad Shahid. Chris Gayle, Rilee Rossouw, Mohammad Mithun (WK), Ravi Bopara, Benny Howell, Nahidul Islam, Farhad Reza, Mashrafe Mortaza (C), Shahidul Islam, Shafiul Islam, Nazmul Islam. Bench: Sean Williams, Nadif Chowdhury, Abul Hasan, Sohag Gazi, Sheldon Cottrell, Mehedi Maruf, Fardeen Hasan. Alex Hales of Rangpur Riders is ruled out of the BPL. AB de Villiers will also leave Rangpur before playoffs. Wahab Riaz has been decent in the last few matches as he picked seven wickets in the four games before the match against Rangpur Riders. He also registered his 2nd hat-trick in the Twenty20 format. Rilee Rossouw is must as captain or vice-captain given his form in the tournament. Alternatives – Shamsur Rahman, Imrul Kayes, Evin Lewis. From the batsmen category, Rilee Rossouw is the best and a must pick. Among the remaining names, Tamim Iqbal and Shamsur Rahman look safe picks given their recent scores. Imrul Kayes and Chris Gayle will be risky while Evin Lewis’ availability has been inconsistent. 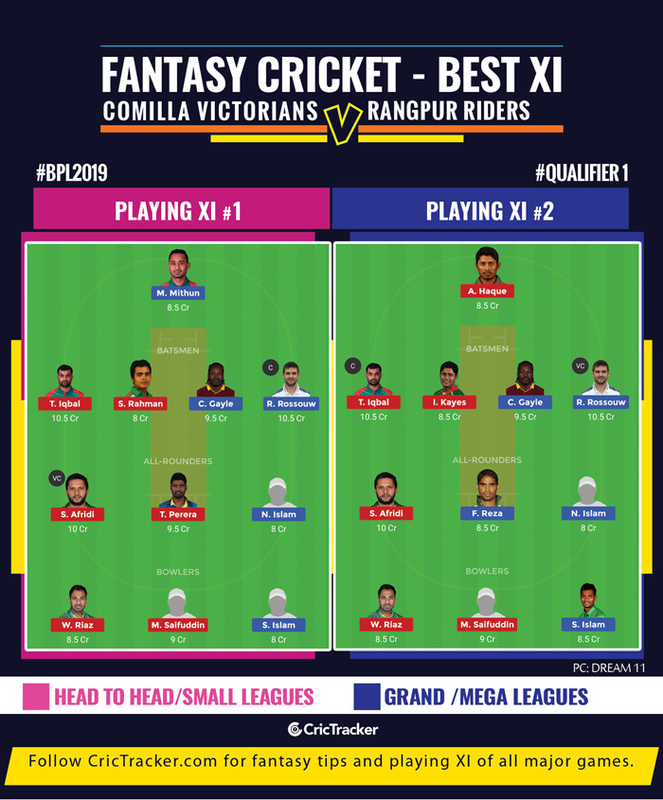 Rangpur Riders will start as favourites given their recent form against the Comilla Victorians despite missing the big names.